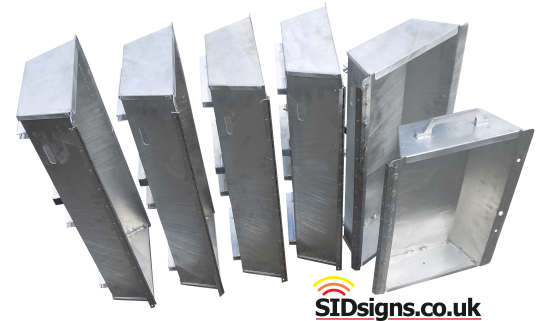 Sid sign casework, quality welded aluminium products. There is a perfect material for speed sign casework, a material which is as light as plastic, but offers the strength of a proper metal. Aluminium, it's light, it's durable, it does not rust it's perfectly suited for outdoor signage applications. All casework designs make use of aluminium in various forms; flat sheet, thick plate as well as box sections and extrusions. These different varieties of aluminium are all sourced from UK suppliers with certification and standards documentation available if required. To make your speed sign as strong and durable as possible all cases are carefully TiG welded, a process which delivers unrivalled strength and durability. For case formats which use aluminium channel rails for fitting purposes these are welded in place instead of being attached with screws, bolts or chemical glue. Things like handles, cable shrouds and hinges are all made from aluminium; this allows everything to be permanently fused together using a proper industrial welding process. The front part of the case, the part you see with the led lighting inside, this is made from a solid sheet of aluminium which is CNC drilled to create a small circular "window" for each led. This technique allows your sign to have a strong metal display face whilst still allowing light to be seen. The easier option is to use one big polycarbonate window but this is just not as strong as a drilled metal design. All the led's inside your case are IP rated waterproof devices which are further weather proofed by the use of an internal clear screen, an extra layer of defence against rain. Typically the front of the sid sign case is finished in a hardwearing satin Black power finish. Sourced from UK manufacturers the Black powder is a polyester system which gives excellent resistance to weathering. A Black frontage gives the perfect contrast to the bright led lights used in the message display. In some locations there might be a need to change this colour to something like a Dark Green or Navy Blue for example. This is not a problem; most RAL colours are available so making a sid sign casework to a specified colour won't be an issue, there is no minimum order either. The rear of the casework is finished in a light traffic Grey finish. Again, it's a tough polyester coating which is designed for outside use. The colour change is partly, cosmetic, it looks nice. Partly practical; it reduces the build up of heat within the casework during very hot days. Just like the front part the back part of the casework can be finished in any RAL colour whether matching or contrasting with the front. There is no minimum order for this service. End of life disposal is something which isn't often talked about but it is an important issue to be considered. Using aluminium means that there is an inherent scrap value in the product, an incentive for it to be recycled. Plastic content is limited to reduce environmental impacts; where possible plastic grades which are used are selected to fit the recycling stream requirements.